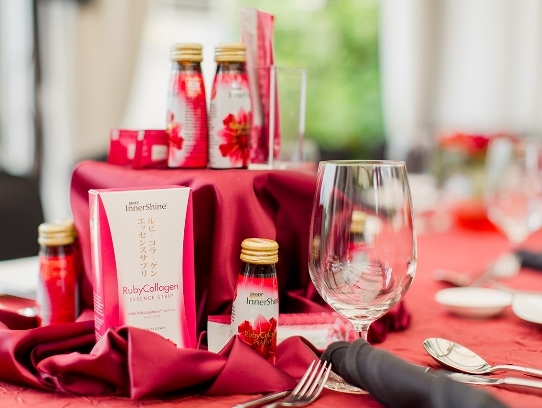 Toast To Beauty With The New Brand's RubyCollagen Essence! 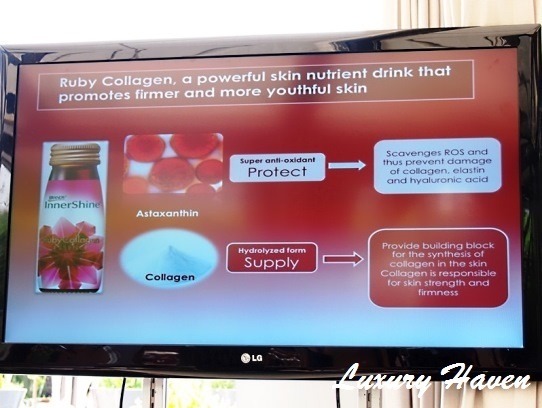 You are here:Home » Product Reviews » Toast To Beauty With The New Brand's RubyCollagen Essence! Women spend thousands of dollars on skincare products, with some even to the extent of going for plastic surgeries. 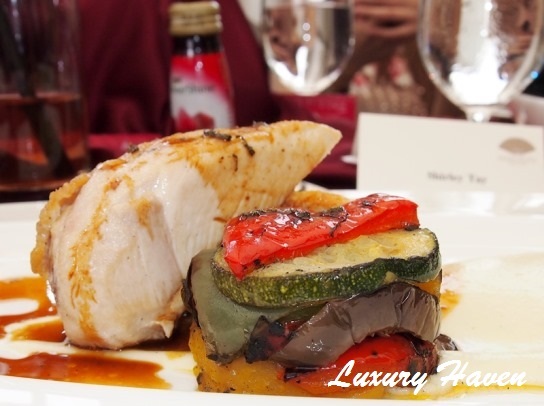 Have you ever thought of healing from within? With the influx of collagen products in the market in the recent years, more are paying attention to these miracle concoctions. Evidently women are heeding the advice, with sales of collagen-enriched drinks, powders & tablets surging rapidly. 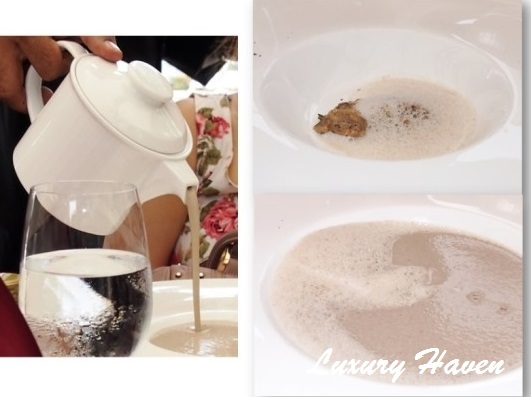 At a recent exclusive media luncheon for the official launch held at the exquisite Mandarin Oriental Hotel, Brand’s #Innershine heralds the next frontier in anti-aging skin care with their new Rubycollagen Essence oral beauty supplement range. Specially formulated for Asian skin, get ready to reverse your skin age & enjoy more supple, vibrant skin in just 6 weeks* with nature’s best-kept anti-ageing secret! Derived from a unique blend of precious ingredients – micro-collagen peptides & #Astaxanthin harvested from a special strain of micro-algae – #RubySignature is a proprietary skin nutrient matrix that promotes firmer & more youthful skin. At 500 times, 800 times, & 6000 times more powerful than Vitamin E (Kurashige et al 1990), CoQ10, & Vitamin C (Nishida et al 2007) respectively, Astaxanthin is one of Mother Nature’s most potent antioxidants. When combined with micro-collagen peptides – collagen molecules that have been broken down through a sophisticated hydrolysis process to aid in faster & more effective absorption by the human body – the resultant RubySignature formulation sets a new standard in oral #collagen supplementation in the pursuit of ageless beauty. 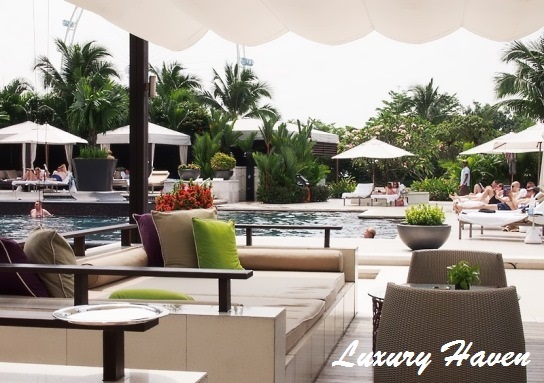 Taking place poolside at the Mandarin Oriental Singapore’s #DolceVita restaurant, the session also featured a special presentation on holistic anti-aging skin care by guest speaker & renowned aesthetic expert Dr Elias Tam of #EHA Clinic. Dr Tam & I greeted each other like old friends when we spotted each other at the event. Those following my blog would know that Dr Tam has been taking care of my face, as well as my 80+ year-old mom’s. Well, you can read more about it in my Product Reviews under Aesthetic Clinics. 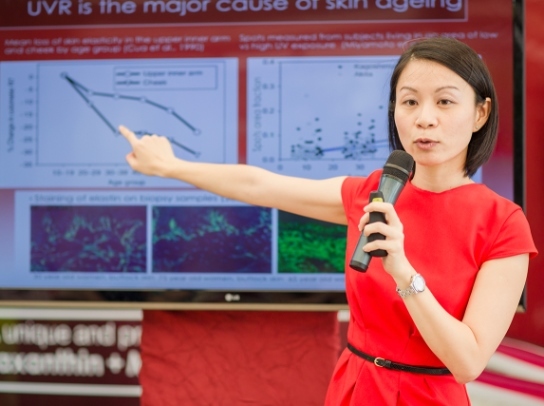 Following that, #Cerebos scientist Dr. Lua Bee Leng delved into the science behind RubyCollagen’s powerful proprietary skin age-reversing formulation. 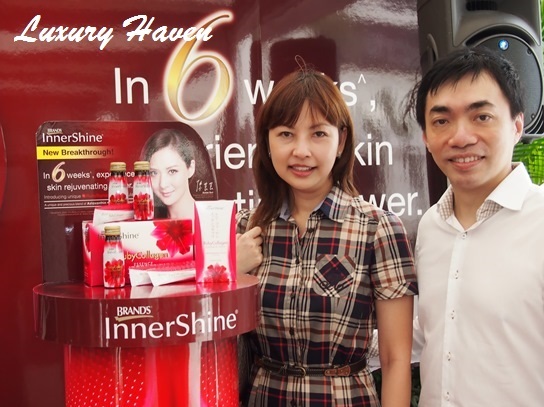 We also got to try the Brand's InnerShine RubyCollagen Essence & Strip. The drink is rich & tasty. I like it, but some may find it too sweet. 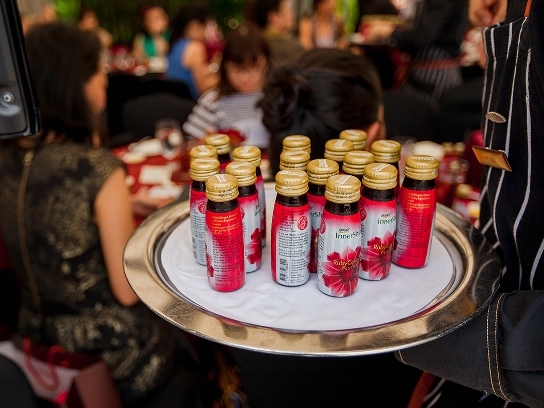 Don't you worry about sugar content; Brand's InnerShine #RubyCollagen Essence contains no added sugar, artificial colourings &/or preservatives. 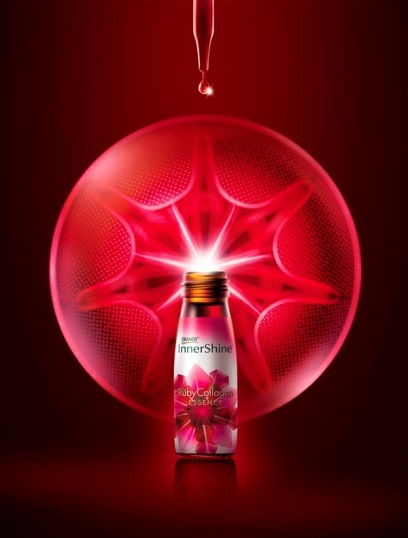 Infused with natural pomegranate juice, Brand's InnerShine RubyCollagen makes for a truly delicious treat & an indispensable beauty oral supplement that addresses the heightened needs of ageing skin. Thumbs-up to the collagen strip, specially designed to fit your purse. I felt like a big kid, snacking on my favourite jelly. 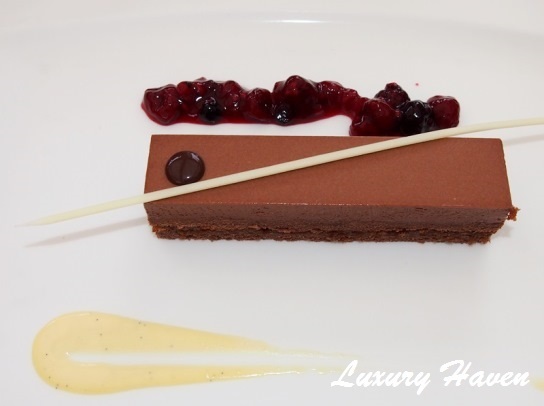 Warning: It’s highly addictive! 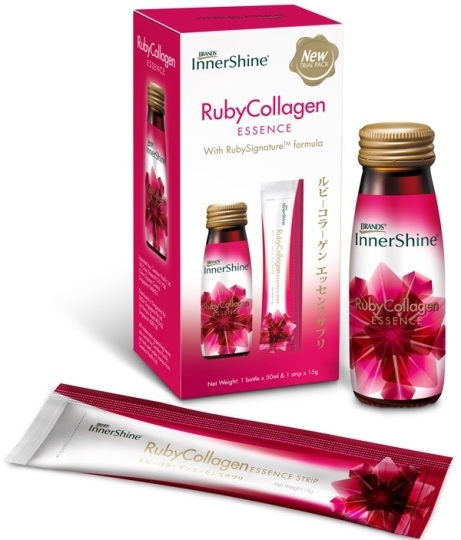 Designed to easily complement your existing topical skin care routine to form a comprehensive beauty regimen, the Brand's InnerShine RubyCollagen Essence range is available in both drink & strip formats. Daily consumption will help to ensure that your body is adequately supplied with the essential nutrients for optimal skin support & protection. For optimum efficacy, it is recommended that Brand's InnerShine RubyCollagen be consumed twice daily to experience the skin age-reversing difference in 6 weeks*. So radiant inside out with #Brand's RubyCollagen Essence & get your tasty treats now, available at all leading personal care stores! Read about my 6-week trial @ BRAND'S InnerShine RubyCollagen Essence Review! 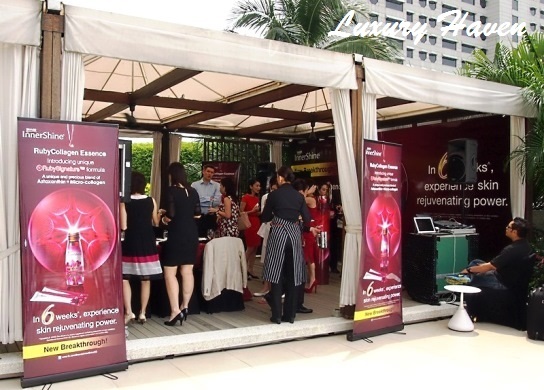 Thank you Brand's, for the invitation to the journey from within! 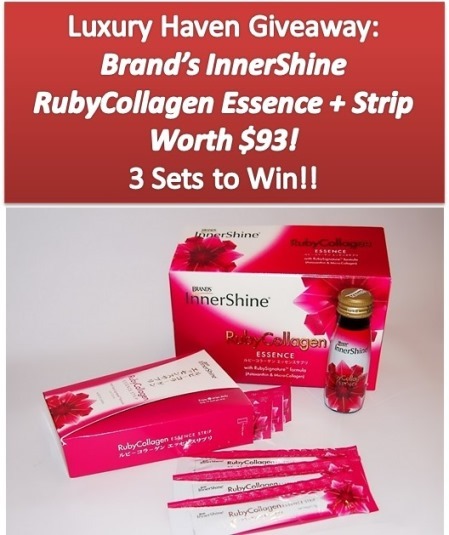 Head over to Giveaway: Brand’s InnerShine RubyCollagen Essence + Strip Worth $93!! 3 Winners will walk away with 1 set each! Good luck! Sounds like a great product!!! 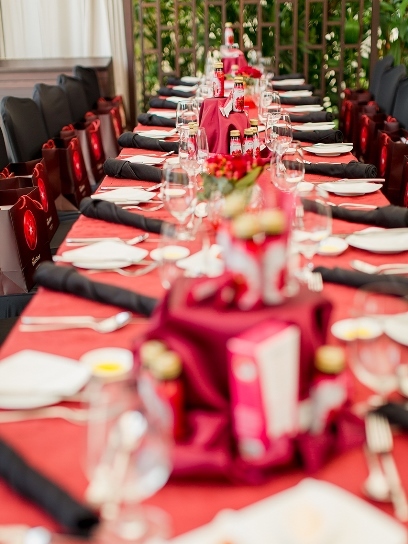 Wonder if they have it here in M'sia..
Btw, love the dining table deco!~ Classy! DS, hope u'll like this just as much! Pepper, so fast? Come & join my giveaway!